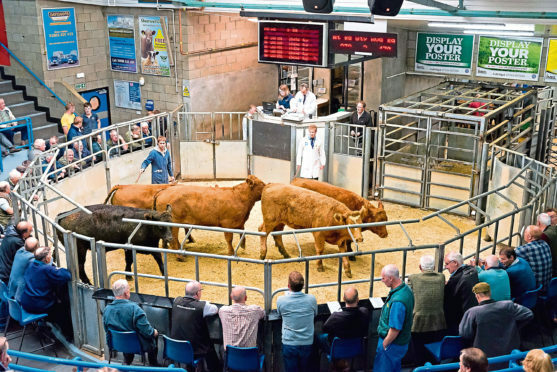 ANM head of livestock, John Angus, selling cattle at Thainstone. A leading livestock auctioneer has spoken out against the use of rye in anaerobic digestion (AD) plants. ANM head of livestock, John Angus, says he is concerned about the amount of land being used to grow feedstocks for AD plants. “This is becoming a real problem for the livestock industry and has taken thousands of acres out of food production,” he said. Mr Angus made the comments while discussing the sharp fall in store cattle prices in recent weeks. He said the price drops were a result of a “perfect storm” of factors including the hot and dry weather, concerns about lack of grass and future supplies of fodder, and an easing of finished prices. However, he said the recent rainfall would help put the industry back on an even keel, and the market was already showing signs of improvement.